(1957) "Good Golly, Miss Molly"
"Good Golly, Miss Molly" is a hit rock 'n' roll song first recorded in 1956 by the American musician Little Richard and released in January 1958 as Specialty single 624 and next in July 1958 on Little Richard. The song, a 12-bar blues, was written by John Marascalco and producer Robert "Bumps" Blackwell. Although it was first recorded by Little Richard, Blackwell produced another version by The Valiants, who imitated the fast first version recorded by Little Richard, not released at this time. Although the Valiants' version was released first (in 1957), Little Richard had the hit, reaching #4. Like all his early hits, it quickly became a rock 'n' roll standard and has subsequently been covered by hundreds of artists. The song is ranked #94 on the Rolling Stone magazine's list of The 500 Greatest Songs of All Time. Little Richard first heard the phrase "Good golly, Miss Molly" from a Southern DJ named Jimmy Pennick. He modified the lyrics into the more suggestive "Good golly, Miss Molly/You sure like to ball". 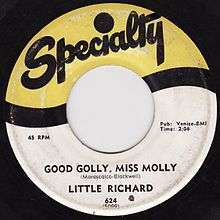 Little Richard himself later claimed that he took the music from Ike Turner's piano intro to Jackie Brenston's influential 1951 rock and roll song "Rocket 88", and used it for "Good Golly, Miss Molly". "I always liked that record," Richard recalled, "and I used to use the riff in my act, so when we were looking for a lead-in to 'Good Golly, Miss Molly', I did that and it fit." One take and one false start from this session were released in 1989 on Little Richard Specialty Sessions (Ace Records sets) as fast versions. At least ten takes were recorded. Take 9 was selected as master for single and album of 1958. Three other takes were released in 1989 on Little Richard Specialty Sessions (Ace Records sets). In January 25, 1967 for Okeh Records, released on Little Richard's Greatest Hits: Recorded Live! Despite the assertions on most of albums mentioned above, there are a studio recordings overdubbed by public noise. In November 1962 Jerry Lee Lewis released the single "Good Golly Miss Molly" (Sun 382), reissued on compilation album Breathless (1967) and on Rockin' Rhythm & Blues (1969). In the early 1960s the song became a continental hit in Latin America performed by the Mexican band Los Teen Tops, whose lead singer was teen idol Enrique Guzman, and sung in Spanish under the title, "La Plaga" ("The Plague"), which actually is a Mexican Spanish slang word referring to "the gang" (as in the "gang one hangs out with"). It was recorded in 1959, and it was the first single of the band. It's considered one of the first Rock en español hits. Almost 30 years later in 1988, it became a hit again for Guzman's daughter, Alejandra Guzmán, on her debut LP Bye Mama. The British band the Swinging Blue Jeans skirted the UK Top 10 hitting No. 11 with their revival issued in early 1964 (HMV Pop 1273). In 1966, the song again became a hit when Mitch Ryder and the Detroit Wheels recorded it in a medley with "Devil with a Blue Dress On," reaching No. 4 on the Billboard Hot 100. Bruce Springsteen and the E Street Band would make "Detroit Medley" a staple of their concerts' encores in the 1970s and 1980s; one such performance is captured on the 1980 No Nukes album. Creedence Clearwater Revival recorded the song in 1969 on their Bayou Country album with slightly changed lyrics. Instead of the result of the gift of a diamond ring being "When she hugs me, her kissin' make me ting-a-ling-a-ling," John Fogerty sang, "Would you pardon me a kissin' and a ting-a-ling-a-ling?" The song was also covered by the Meat Puppets on their 1986 album Out My Way. The song was covered on the Crests' first LP album, The Crests Sing All Biggies, in 1960. The song was covered by Def Leppard during the Hysteria World Tour in 1987. The song is included on the Jerry Lee Lewis album Live at the Star Club, Hamburg, recorded in 1964. In the feature film King Ralph (1991), John Goodman's title character played the song. Little Richard performs in the related music video. The song has also been covered by the Sonics on their 1965 album Here Are The Sonics and as well as by Screaming Lord Sutch. The Deep Purple song "Speed King" references the song ("'Good Golly', said Little Miss Molly"). An episode of Hannah Montana is titled "Good Golly Miss Dolly" in a reference to this song. ↑ White, Charles (1994). The Life and Times of Little Richard: The Quasar of Rock. Da Capo Press. p. 259. ISBN 0-306-80552-9. ↑ "Good Golly, Miss Molly (song by Little Richard) ••• Music VF, US & UK hits charts". Musicvf.com. Retrieved 2015-11-09. ↑ "Rolling Stone's 500 Greatest Songs of All Time". Rolling Stone. April 2010. Retrieved September 28, 2015. ↑ Charles White (2013-03-15). "The Life And Times Of Little Richard: The Authorised Biography". Books.google.com. Retrieved 2015-11-09. ↑ Little Richard – The Specialty Sessions – 8 Album Set (booklet). London: Ace Records Ltd. 1989. p. 29. ABOXLP 1 (set), ABOXBK1 (booklet). ↑ White, Charles (1994). The Life and Times of Little Richard: The Quasar of Rock. Da Capo Press. ISBN 0-306-80552-9. ↑ "Good Golly Miss Molly (song by The Swinging Blue Jeans) ••• Music VF, US & UK hits charts". Musicvf.com. 1964-03-21. Retrieved 2015-11-09. ↑ "Devil with a Blue Dress On / Good Golly Miss Molly (song by Mitch Ryder) ••• Music VF, US & UK hits charts". Musicvf.com. Retrieved 2015-11-09. ↑ Gilliland, John (1969). "Show 54 - Hail, Hail, Rock 'n' Roll: Getting back to rock's funky, essential essence. [Part 3]" (audio). Pop Chronicles. Digital.library.unt.edu. ↑ "Little Richard - Good Golly Miss Molly - vidéo Dailymotion". Dailymotion.com. Retrieved 2015-11-09. "Whole Lotta Shakin' Goin On"